It's possible to amend or change the default functional text of a survey. By this, we mean the text provided by SmartSurvey, rather than entered by the user as part of survey creation. This text can be edited by clicking "options" in the white bar and choosing "Translations". This is available whether or not the survey is set up as multilingual. 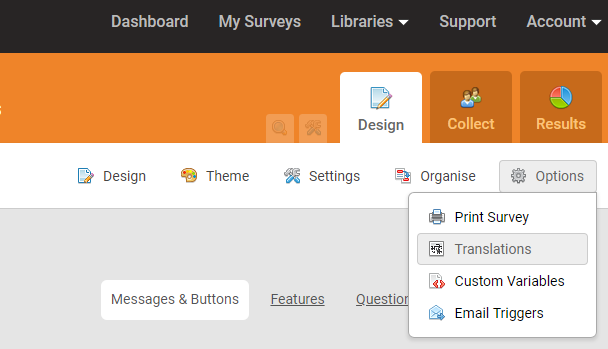 For the language for which you want to change the text, click on "Customise Text"
You'll now see a page with a list of the default text, the translation text, and five categories at the top - "Messages & Buttons", "Features", "Question Types", "Misc", and "Reports". if the Survey already has question text added, a sixth category, "Survey" will also be present. To edit the displayed text for any of the listed options, click "Edit" for the line of text you wish to change, enter your alternate text, and click "Save". This will change the text that's displayed for this survey. Any changes made to the text will only apply to the survey that you are editing. It's a good idea to rename your new translation on the "settings" page. This will make it easier to identify at a later date. If you wish to apply the same changes to another survey, you can do this by creating a new translation for the new survey. When you do this, you will be offered the chance to copy a translation from another survey. Simply choose the orginal survey and then the translation you wish to copy.